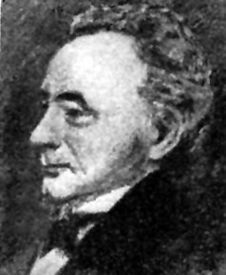 Hall Jackson Kelley (1790-1874) – Kelley was writer and teacher from New England who was known for his strong advocacy for western settlement of the Oregon Country in the 1830s. He was born in Northwood, New Hampshire, on February 24, 1790, to Benjamin Kelley, a physician, and Mary Gile. He attended an academy in Gilmanton, New Hampshire where the family had moved. When he was just 16 years old, he left school and was teaching in Hallowell, Maine. A few years later, he attended the Middlebury College in Middlebury, Vermont where he graduated with Master of Arts degree in 1814. He married Mary Baldwin, daughter of a minister, on May 4, 1815, and began teaching in the public schools. Unfortunately, his wife died just a year later. He worked as a school principal in Boston, Massachusetts from 1818-1823 and while there attended Harvard College in 1820. He was married for a second time to Mary Perry in April 1822. Early on Kelley became interested in settlement of the American West after reading about the Lewis & Clark Expedition and Wilson Price Hunt Expedition. In 1828 he began to act on those interests. That year he tried to organize a group expedition to Oregon but was unable to get the funds for outfitting. That same year he began lobbying the United States Legislature for the funding of the “American Society for Encouraging the Settlement of the Oregon Territory.” This included a memorial to Congress in February that laid out plans for a city where the Columbia River meets the Willamette River (present-day Portland, Oregon) and a proposal to name mountains in the Cascade Range after US presidents. At the time, the Oregon Country was officially under the joint administration of the United States and Britain pursuant to the Anglo-American Convention of 1818. However, it was effectively controlled by the British Hudson’s Bay Company, which actively discouraged U.S. settlement. 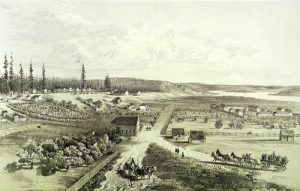 Despite the discouragement of the Hudson’s Bay Company, Congress incorporated the American Society for Encouraging the Settlement of the Oregon Territory in 1829. During this time Kelley also wrote numerous articles encouraging U.S. settlers to move into Oregon Country. In 1830, he published a Geographical Memoir of Oregon, which contained the first map of that territory ever compiled, as well as a settlement guide for prospective emigrants. 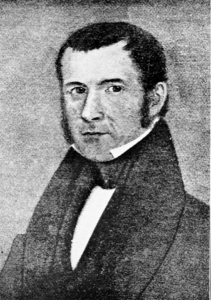 In 1831 Kelley sought to undertake an expedition to the west with Nathaniel Jarvis Wyeth of Boston. But, after having made the arrangements for sending out a party of several hundred people, the plan was abandoned at the last moment. The next year Wyeth went west without Kelley, having attracted investors in Boston. The same year, Kelley’s writings were influential in inspiring Benjamin Bonneville to undertake his 1832 expedition to the West. In 1833, Kelley finally set out with a small party for the West, traveling first to New Orleans, Louisiana, where, to Kelley’s great personal loss, most of the men left the expedition. Hoping to salvage his expedition, he sailed south to Veracruz, Mexico where he organized a party of Americans who had settled at Monterey. The party crossed from Mexico into California where Kelley encountered a known fur trapper and trader, Ewing Young, who was traveling into the Oregon Country backed by the missionary Jason Lee. Kelley invited Ewing Young to accompany him north to Oregon, but Young at first declined. However, he soon changed his mind, and the group, which included Webley John Hauxhurst and Joseph Gale, both prominent figures in the Willamette Valley, set out in July 1834. On the trip north, Kelley fell ill with malaria while among the Coquille tribe in the Umpqua River Valley near present-day Roseburg, Oregon. He was rescued by Michel LaFramboise, a Hudson’s Bay Company employee at Fort Umpqua. On October 27, 1834, Kelley and the party arrived at the Columbia River, where they were almost at once evicted by Dr. John McLoughlin, the district chief at Fort Vancouver, Washington. However, McLoughlin gave him passage in 1835 to Hawaii. From there, Kelley found a ship and sailed home to Boston, broken in health and fortune. Kelley continued to write newspaper articles and memoirs based on his trip that encouraged Americans to settle in Oregon. In February 1839, parts of his memoirs and a finely engraved map, showing the “Territory of Oregon” were presented to the United States Congress. The map was compiled in United States Bureau of Topographical Engineers in 1838. In 1851 Kelley petitioned Congress for reimbursement for his expenses on the 1834 trip but was unsuccessful. Kelley spent his later years in Three Rivers, Massachusetts. In 1868, he wrote A History of the Settlement of Oregon and of the Interior of Upper California, and of Persecutions and Afflictions of Forty Years’ Continuance endured by the Author. By that time emigrants on the Oregon Trail had already numbered into the tens of thousands. Hall Jackson Kelley died in Palmer, Massachusetts on January 20, 1874, at the age of 83.